Absolute killer package if you wanna get started with The Jazzinvaders. There’s no better introduction offer. This one contains their four latest albums including the one they recorded with Blue Note recording living legend Dr. Lonnie Smith. What’s not to like ? Grab it while you still can cause it’s only available for a limited time! Head over to the Social Beats store and check out their offers! An album by the Dutch Nu-Jazz Movement jam packed with the newest tracks by four Dutch NU-Jazz bands. 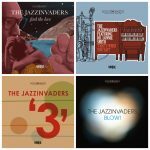 The Jazzinvaders are in de midst of recording their third album of which the two tracks “Reverse” and “Make it Work” give an indication of the new Jazzinvaders sound. Next to vocalist Linda Bloemhard you will hear the smooth and soulful voice of Brian Zalmijn. We invite you to check out the tracks on the Jazzinvaders Myspace player to then ,of course, buy the album on Itunes!! !